Green Level’s Own Officer McGill Gets Award!!! Home NewsGreen Level’s Own Officer McGill Gets Award!!! In Green Level, Sgt. Amanda McGill is known as the Dancing Deputy, though she tells people they can call her Mandy. She got that nickname when she joined the crowd in her Alamance County Sheriff’s Office uniform dancing at the town’s big Fourth of July celebration. To her it was part of the job. “To me community policing is about showing people that we’re all the same,” McGill said. Since she was promoted to sergeant about a year and a half ago, Green Level has been McGill’s beat. She says it’s one of the places in Alamance County that still feels like a small town, where people are surrounded by family who might get angry at each other when there is an argument, but bring over a casserole when there is trouble. McGill talks a lot about helping people out. She was raised on community involvement going on the Crop Walk with her parents and the Bike-A-thon for St. Jude’s Hospital. 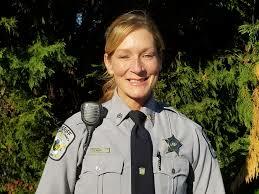 Now she is heavily involved with Hospice and is the Special Olympics coordinator for the sheriff’s office. She suspects that’s why she was presented the 13th annual Circle K Ranch Cowgirl Up Award during an Election night celebration at the Ramada Inn with Sheriff Terry Johnson and District Court Judge Katie Overby – the 2014 winner. A 43-year-old single mom of two teenagers with seven years in uniform, McGill might not be the conventional picture of a law-enforcement officer, but it wasn’t something she fell into. A job she loved was ending so she started law-enforcement training at Alamance Community College – in her mid-30s. Those parents, Wilton and Judy Rivenbark, still live in Burlington, and made it possible for McGill to go into a 24-hour-a-day career like law enforcement with young children. “I couldn’t have done this job of they couldn’t take my kids to school,” she said. Between finishing the program and getting hired, McGill was out of work for more than a year. Without help from her parents and church, she could not have kept up with her bills. It’s something she says shapes the way she looks at people, because you never know everything someone is going through, so do what you can to make it easier on them. McGill grew up around Burlington and remembers when it felt more like a small town. She put off her graduation from Elon College for marriage and children in 1996. When she went back to Elon University in 2005 the one class she needed to graduate had turned into five, and she was separated with two children in diapers. She managed to substitute a couple of internships for some of that class work, one of which became a job at the Caring Family Network. Later she became the community outreach coordinator at Crossroads Sexual Assault and Resource Center. The grant funding that job ran out, and McGill had about a month’s notice that she would be laid off, which led her to the sheriff’s office.